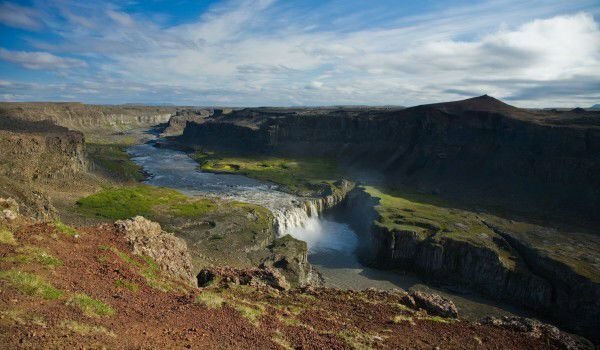 Along with beautiful waterfalls Galfoss, Dettifoss and Selfoss, Hafragilsfoss, there is another natural phenomenon that can be seen in the park of the glacial river Jökulsá á Fjöllum in Iceland. Selfoss was formed about a kilometer south of the mighty waterfall Dettifoss, and Hafragilsfoss is a little further down, about half a kilometer from Detifoss, following the river. Hafragilsfoss waterfall is very deep in the Icelandic Jökulságljúfur canyon. As part of the water base, formed by melting glaciers, the water level of this beautiful landmark is greater in winter. The height of the water drop in Hafragilsfoss is 27 meters and its crest is 91 meters wide. The average water content of the waterfall is about 200 cubic meters / sec, and at high water season, it reaches 420 cubic meters / sec. Like the other large waterfalls slightly upstream of the river Jökulsá á Fjöllum, Hafragilsfoss waterfall can be seen well on both sides of the river. For more accessible is considered the east side where there is a platform for observation built. Never allow yourself to visit a waterfall without a camera that can capture all the magnificent view of the water droplets spray. If you decide to access Hafragilsfos’s waterfall on the west side, be ready for a real adventure and a test of physical ability. For this you need stable equipment. You will need to go through rope ladders and a few steep climbs in the area. These obstacles, however, will allow you to reach close to the natural phenomenon and enjoy the view to it much better than on the observation platform. The east side of the River also has its advantages, however, because this point reveals an amazing view of the entire canyon downstream, which was excavated by Jökulsá á Fjöllum. The panorama really gives one the exact feeling of how natural forces work in the Icelandic protected area. You can get to the waterfall Hafragilsfoss easily by car, take the exit on the east coast road to the parking for Detifoss. Continue north on Route 864 fro about 2 miles, then you will see another marked exit to the left. Namely, it leads to a parking lot for the waterfall Hafragilsfoss.